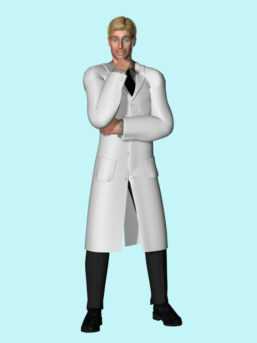 A brilliant scientist who fell on hard times when he was betrayed by his boss, benefactor, and former friend Max Indeks. Twiss was supposed to be heading up one of APEX Laboratories’ top secret projects, but was devoting too much company time and resources to his own personal experiments. After Max found out about this, he unceremoniously fired Ted and had him arrested for theft. Alpha Woman publicly apprehended Twiss, shaming him and ruining his budding career. Ted spent a couple of years in Metrobay Prison before escaping and devoting his life to getting revenge on (among others) Max and Alpha Woman. Ted got his chance when he tricked Alpha Woman’s junior partner, Valient Grrl, into a trap and successfully brainwashed her into his obedient robot slave. He then was able to acquire a great deal of personal information about his foe from the mindless Valient Grrl and was able to use her as bait to lure Alpha Woman to him, successfully blackmailing her into trading places with Valient Grrl as his slave. Valient Grrl, in turn, was re-enslaved as well. Ted began to set his sights higher, seeking to build a small army of enslaved beautiful women to help him exact his revenge against Max Indeks. He had his drones sneak into Metrobay Police Headquartersand capture and reprogram their highly advanced supercomputer Sentius to suit his needs, while Sentius proceeded to capture and convert crime lab scientist Marcy Smith into CyberMarcy, who was then passed off to Ted. Marcy’s highly intelligent and resourceful mind, even as an obedient robot slave, lead Ted to position her as captain of his small army and she became arguably his preferred bedroom conquest. Ted later acquired Brown Sugar as his final robot slave, but his activities had not gone unnoticed. His former partner and one-time lover, Belinda Giolla, also the woman responsible for reporting his side projects to Max Indeks and leading to his woeful state of affairs, discovered his scheme and set out to undermine him. Belinda successfully stole Valient Grrl from him and reprogrammed her to serve her, and later launched a small-scale invasion of his lair, which quickly digressed into a chaotic climax with a rebelling Sentius and resulted in he and Belinda’s capture and imprisonment by the Superheroine Squad, though not before Ted experienced a slight change of heart and heroically saved them from Sentius’s attack. Because of his heroic actions, he was given a far more lenient sentence than Belinda was given, and when Sentius resurfaced, he was afforded yet another opportunity to shave off time by assisting the Superheroine Squad once more, a proposition he reluctantly agreed to. His heroics seem to be genuine and honest, and he has proven himself to be a valuable aid to the squad during times of intense crisis and in the aftermath of the events of the Night of the Drones. He was even allowed a moment of vengeance against his foe Max Indeks, a blow Max won’t soon forget. Ted has since become an ironically beneficial aid to the Superheroine Squad, using his skills and intellect to help return many members to their original states after being robotized by Sentius, and is often found assisting Silver Satin in her crime lab. A slight, but noteworthy, example of his better half is the fact that he has not leveraged his knowledge of various members’ secret identities against them or traded this knowledge to any of the many villains willing to pay handsomely for such vital information. He is not beyond his original, lustful nature, however, and has still fantasized about the various buxom and beautiful women around him, even including his hated rival Belinda. His relationship with Silver Satin is unique due to their rather complicated history, but he appears to be a genuine friend to the similarly gifted intellectual heroine. He has also had a brief but notable sexual encounter with the young Blackout, who harbors an innocent crush on him and expressed interest in returning to her previous robotic state. Against his better judgment, he was also placed in charge of studying Ms. Metrobay’s robot duplicate Milkmaid.